Despite the overwhelmingly positive feelings patients and family members have about hospice, a significant proportion of patients are not referred to hospice until very late in the dying process. More than one third of all patients who are enrolled in hospice die within the first week, and many of those patients die within the first 48 hours. Overall, half of those who are enrolled in hospice die within the first 14 days. The fact is that many patients live quite awhile after being referred to hospice if the decision is made earlier in the dying process. 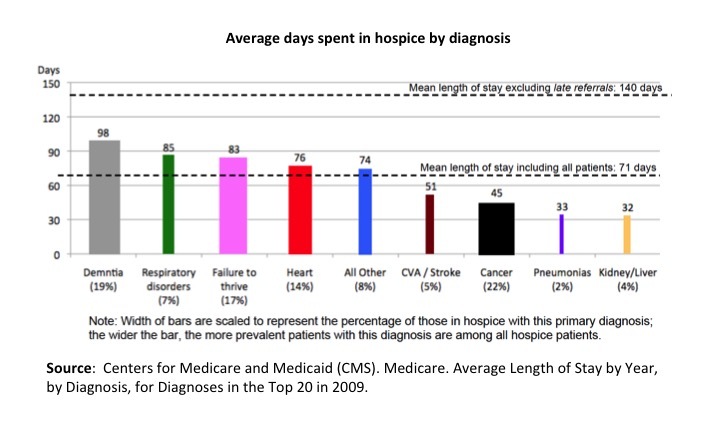 The figure below charts the mean length of stay for patients in hospice by disease category. If “late referrals” are excluded, the average length of stay for hospice doubles from 71 days to nearly 140 days.